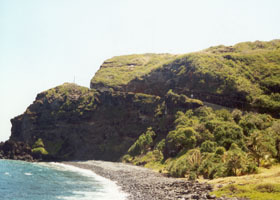 The 20 photos in this part, from my October 1999, May 2000, and November 2001 visits to Maui, are from the stretch of the Piilani Highway through rugged upcountry south Maui, including part of county route 31 from Oheo Gulch and Kipahulu at mile 38.55 (where it joins the Hana Highway, which is covered by the separate photo pages preceding this one) to where it turns into state route 37 near the Tedeschi Winery at about mile 15.1. 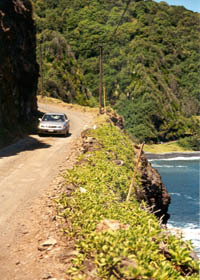 The county-maintained Piilani Highway is much less famous and traveled than the Hana Highway, and indeed does not appear on some maps. 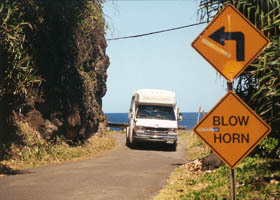 Even before then, it certainly was more treacherous than the Hana Highway, which scared away many tourists and also made rental car companies unhappy (see the warnings below). But as you'll see, the Piilani Highway is quite interesting in its own right, and will be worth the time and effort for travelers up to the challenge. This part of the road photos collection is divided into two pages. Below is introductory information about the entire highway, plus photos of or from the highway from its eastern end south of Kipahulu where it meets the Hana Highway, west to Kaupo. Page 2 completes the journey, with photos from Kaupo to Ulupalakua, where the Piilani Highway meets the Kula Highway (state route 37), as well as links to the rest of the road photos collection, other sections of the Hawaii Highways site, and other relevant sites. 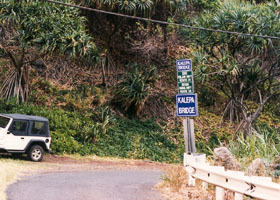 Both pages cover the highway in reverse milemarker order, from east to west, for continuity with the photo pages for the Hana Highway, which together with the Piilani Highway and state route 37 (the Kula Highway and part of the Haleakala Highway) forms a loop through east Maui around the Haleakala volcano (see map below). Note: In case you want more detail, clicking some of the photos below (for now, just some from my 2001 trip) will call up enlarged, higher-quality (less .jpg compression) versions. Those alternate versions have larger file sizes, so please be patient while they download. Warnings: Parts of the Piilani Highway are narrow, rough and/or unpaved, and rental car companies generally were never too wild about their vehicles being driven there. 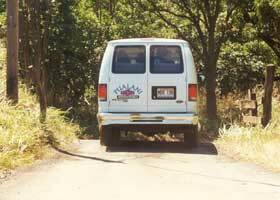 Sometimes vehicles can get stuck on the unpaved stretches (especially after rains on those stretches, or upslope on the Haleakala volcano), or the road is closed for other reasons, so tourists should check in with the Haleakala National Park ranger station at Oheo Gulch before traveling the route. 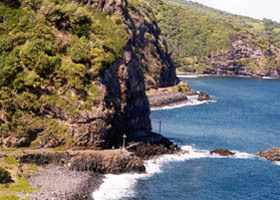 Also, the road is slow (particularly the cliff-hugging east end, and the unpaved stretch through Kaupo), and is definitely not a short-cut back to central Maui from Hana. Even after the Piilani Highway is reopened to through traffic, allow at least three hours to return from the Oheo Gulch/Kipahulu area to central Maui, and at least a half-hour more if leaving from Hana. 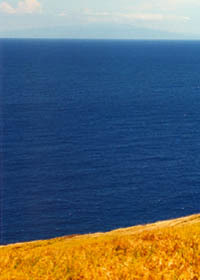 Driving at night, or in poor visibility, is not recommended for drivers unfamiliar with the road, especially east of Kaupo. © 1999-2003, 2006-2008 Oscar Voss.